I’ll admit it; I’m a sucker for prospect lists. Every time I see an organizational ranking published (whether it be from BA/John Callis, BP/Jason Parks, ESPN/Keith Law, MLB/Jonathan Mayo, John Sickels or whoever, I put the rankings into a big spreadsheet and do comparison analysis (I’d publish on Google Docs it except that Law’s stuff is ESPN insider only and I wouldn’t want to get into trouble). Every time any of these guys puts out organizational top 10s, I capture that too into one big file too. So, this week is an exciting time because one of the leading prospect voices out there has published his annual rankings lists. Keith Law published his System rankings 1-30 on 1/28/14 and published his Top 100 prospects list on 1/29/14. The links themselves are ESPN-insider, which I believe is well worth the pittance of a cost per year just to get access to Law and Buster Olney‘s stuff (among others). Law has our system ranked 18th this time around, a slight increase from last year’s ranking of 21. In the five years that I’ve been capturing Law’s organizational rankings, this is as high as he’s had the system ranked believe it or not; his 2012 rankings (where Baseball America famously had us ranked #1) came out after the big Gio Gonzalez trade and thus we didn’t get the high ranking we would have expected (Law said he dropped the system from a top 5 ranking b/c of that trade). 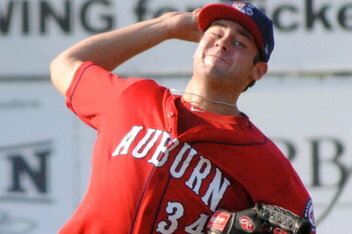 Then the gap, then Law ranks 6-10 as went Matt Skole, Christian Garcia, Carlos Rivero, Matthew Purke and Michael Taylor. So, no mention of Taylor Jordan or Ian Krol, both of whom graduated and performed more than ably in the majors in 2013. 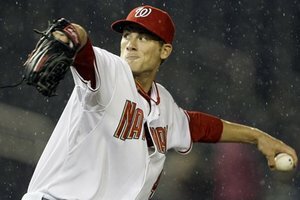 There was no mention of Robbie Ray, who Law never liked and never gave much credit to even when in 2011 he was out performing Cole in the low minors despite being the same age and same draft class, but who was regarded enough in Detroit to basically fetch a 4-win established MLB pitcher in Doug Fister. There was no mention of Jeff Kobernus, who did get some MLB innings but isn’t considered a real prospect. No mention of Nats minor league batter of the year Billy Burns (again, not really a prospect in lots of evaluator’s eyes). No mention of Eury Perez as a top 10 candidate, and obviously no mention of Tanner Roark (who in January 2013 pretty much everyone saw as an organizational arm playing out the string to minor league free agency). Law did say at the time that if Sammy Solis got healthy again he’d be back in the running for his top 100. Amazingly Rivero, a waiver claim who ended the year demoted to AA, was his 8th best prospect for the system, quite an indictment. Well, either that or a blind spot for Law, who is more impressed by tools in lower-minors kids than capabilities in prospects in the upper minors. … and considering the litany of graduations/trades/exoduses out of the system (Rendon, Jordan, Krol, Ray, Rivero, Burns and Roark all ineligible for a 2014 analysis), how do you explain the fact that he thinks the system is basically treading water? You have to think Law’s top 5 for the system now starts Giolito/Cole/Goodwin but then who knows where it goes from there. I know from chat responses that Law is down on Purke now and that he didn’t ever really rate Jake Johansen or Drew Ward as 2013 draft picks. Does Karns still qualify as a prospect? Yes I believe so. Solis came back and performed post injury but was he that impressive in 2013? Perhaps Law’s thinking goes like this: he likes our top 3 prospects (clearly; Giolito, Cole and Goodwin all made Law’s minor league-wide top 100 list with Giolito at #21). Law rates these top 3 guys as strong enough to make up for the graduations from last year. Then there likely is a gap, then perhaps a small grouping of Karns and Solis, both of whom Law likes and both of whom he probably believes would make either #5 starters or good bullpen guys. Then after that a grab bag to include Skole, Taylor, Perez and perhaps a couple guys from our 2013 draft class (Austin Voth?). The problem with the back side of this theoretical top 10 list is that it includes a slew of players who were hurt or who treaded water in 2013. 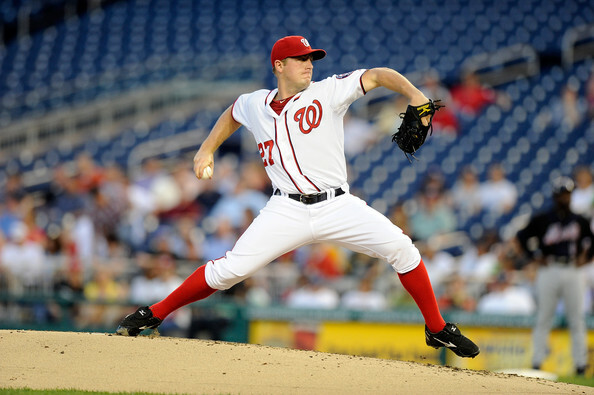 Jordan Zimmermann was the real “ace” of the 2013 Nats. Photo Unk. I began thinking about system-wide predictions for the pitching staffs for the 2014 teams and realized that I heavily depend on doing staff-by-staff analysis to do the predictions. I wasn’t going to do these review posts this year (mostly because they’re incredibly time consuming) but I also realize they’re a) the best way to do predictions for the coming year and b) the best way to becoming more vigilant in really forming an opinion on all the short-season guys. So, without further ado, and despite the fact that its mid December and this post should have been done two months ago, here’s the first of many organizational reviews of the pitching staffs of our various affiliates for the 2013 season. We’ll start with the Majors and move downwards. Here’s the same version of 2012’s post for a historical review. I think we all know how the major league squad did, so I’ll try to be brief here for the stalwarts we know are going to be with the team in 2014. (Editor’s note: “brief” has turned into nearly 3,000 words. oh well). A lot of this analysis is for the “Outlook for next season” sections, which help me drive the predictions for all the pitching staffs next year. All stats are courtesy of either Baseball-Reference’s Washington 2013 page or via Fangraph’s Washington 2013 page. Also useful here are the Big Board and the Nats Draft Tracker. Washington starters. 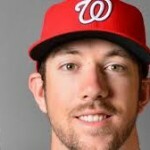 The rotation started the season with Strasburg, Gonzalez, Zimmermann, Detwiler and Haren. At season’s end it was Strasburg, Gonzalez, Zimmermann, Haren and Roark, though not necessarily in that exact order thanks to skipped starts, ejections/washed out outings and some re-ordering at the all-star break. Stephen Strasburg had a down year for a supposed “Ace” in this league by conventional stats (8-9, 3.00 ERA) but by most advanced measures Strasburg was still in the top 10-15 pitchers in the league. He still averaged more than a K/inning, he had the 2nd highest fastball velocity for any starter in the majors (only behind Matt Harvey). He suffered from incredibly bad run support all year; the Nats scored 2 runs or less in 16 of his 30 starts and he got Losses or No-Decisions no less than 13 times when he allowed two or fewer earned runs and pitched enough to qualify for the decision. That’s crazy. With normal run support of 3-4 runs a game Strasburg easily could have had a record like 17-6 with a 3.00 era and been in the running for Cy Young votes. On the bright side; he made 30 starts in year two post Tommy John surgery, and he should be in full force for 2014. Outlook for next season: 2014’s opening day starter. Gio Gonzalez took a step back from his magical 2012 season and more closely resembled the starter that he was for Oakland in 2010-2011. Which isn’t a bad thing; he still posted a 3-war season, he was still a 113 ERA+ guy, and he answered the bell every time his spot was up for the 4th year running. He was a bit more hittable this year, gave up nearly twice as many homers as in 2012 (but in line with his years prior) and we got a glance of what we can probably expect from him going forward. On the year he was 11-8 with a 3.36 ERA, and like Strasburg he had a number of no-decisions where the team just didn’t score him any runs. Outlook for next season: 2014’s #2 starter. 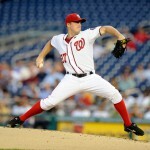 Jordan Zimmermann had his best season as a pro, posting a 19-9 record with a 3.25 ERA and a 1.088 whip. This earned him a 7th place Cy Young award finish and likely earned him tens of millions of dollars on his eventual contract extension. Zimmermann maintained a 4/1 K/BB rate, good for 13th among all qualified starters and even better considering the velocity at which he pitches (9th in the league in vFA at 93.9mph). A side note on just how amazing Matt Harvey is: he was 2nd in the league in K/BB and FIRST in vFA; that’s a pretty special combination. Zimmermann seems set to broach 8 figures in arbitration and it may behoove the team to try to work out a contract extension before he hits the open market. Outlook for next season: 2014’s #3 starter. Ross Detwiler made 8 decent starts in April and May before missing a month thanks to an oblique strain, then made 5 mostly mediocre starts in June before being lost for the season thanks to a herniated disc in his back. Detwiler’s injury exposed the one glaring weakness in the construction of the 2013 Nationals; absolutely no starting pitching depth. Much ink has been spilled here and elsewhere on Detwiler’s status for 2014, but I will say this: look at his game logs from the early part of the season and you’ll find that his performance was north of expectations for a #5 starter. Because of this (and his option-less status frankly), I am predicting for now that he’ll win the 5th starter battle in the spring (more on this after all the organization reviews are done and we talk about 2014 predictions). The question will be; can he stay healthy and can he keep the job? Outlook for next season: 2014’s #5 starter. Dan Haren was, as we all know, awful in April, mostly awful in May and god-awful in June. He hit the D/L for a brief stint in what was an obvious “forced” trip, for when he was asked he didn’t even know for what injury he was being shelved for. At the time of his D/L trip he literally was the worst or close to the worst starting pitcher in the game by nearly any statistical measure. Yes he picked up his performance after the D/L trip, but by that point the damage had been done. He had game after game where suddenly the offense was down 5-6 runs and the game was basically over. For the year the team was 11-19 in his starts. Not a great return for the $13M contract he signed. The Nats didn’t dare to offer him a qualifying offer and his tenure ended with an ironic slap in the face as he pitched one of his best games in his final Washington appearance. 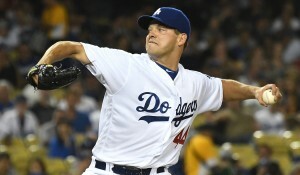 Outlook for next season: signed with Los Angeles Dodgers for 1yr/$10m to be their 4th or 5th starter. Nathan Karns was the first minor league reinforcement starter to get the call (here’s my “first look” post at his 5/28/13 debut). In three starts he got hit hard: 17 hits and 5 homers that resulted in a 7.50 ERA and a return to AA. We’ll talk more about Karns in the Harrisburg review. Based on what I saw, it may be that he’s eventually bound for the bullpen, where he can throw harder for shorter bursts. But his value as a starter is obvious if he can corral all of his pitches. Outlook for next season: AAA rotation. Taylor Jordan got the call-up when the team finally lost patience with Haren and sent him to the D/L in June (here’s my “first look” post at his 6/28/13 debut). 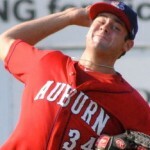 Jordan looked pretty good in his 9 starts, posting a 3.66 ERA and a 3.49 FIP. Not bad considering where he started the year (in Potomac’s rotation). Jordan was shut down in Mid-August thanks to the organizational innings limit for post-Tommy John surgery pitchers (he threw a total of 142 across 3 levels on the year). Now the big question; what to do with him for 2014? Unfortunately for Jordan (and as we’ll talk about in a moment), his departure opened the door for other opportunistic pitchers and he may have been passed on the organizational depth chart. For now, I’m predicting that Jordan won’t win the 5th starter job over Detwiler and will be sent to Syracuse to get starts and serve as the organizational starter depth that we struggled with in 2013. Outlook for next season: AAA rotation. 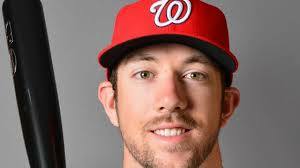 Ross Ohlendorf took a minor league gig with the Nationals to try to revitalize his career and went a somewhat pedestrian looking 4-6 in 13 starts at AAA. He re-vamped his wind-up and mechanics, threw with some good pace and eventually a streak of good starts led to his June call-up. He spent the rest of the season as the Nats’ long-man/spot starter, getting 16 apperances and 7 starts in posting a servicable 3.28 ERA. He seemed to tire when featured as a starter, only going past the 5th inning three times, and Davey Johnson eventually seemed hesitatant to use him because of it. Eventually, a shoulder strain 15 day D/L trip and a poor spot-start in early September opened the door for others to grab starts (see below), but Ohlendorf remained the emergency starter for the rest of the season. Outlook for next season: he did enough to get tendered a contract (which he quickly signed; 1yr/$1.25M), and seemingly he will slot back in as the long-man/spot-starter role for the MLB team. He doesn’t seem to have enough to compete and win the 5th starter competition. Will the team dump him to AAA as an inexpensive starter insurance policy? I doubt it for now; they probably opt to keep Ohlendorf as the last guy out of the pen and keep Jordan on regular starts in AAA. Tanner Roark toiled in AAA most of the season, and seemingly was set to exit the organization as a MLFA before earning a call-up in August. 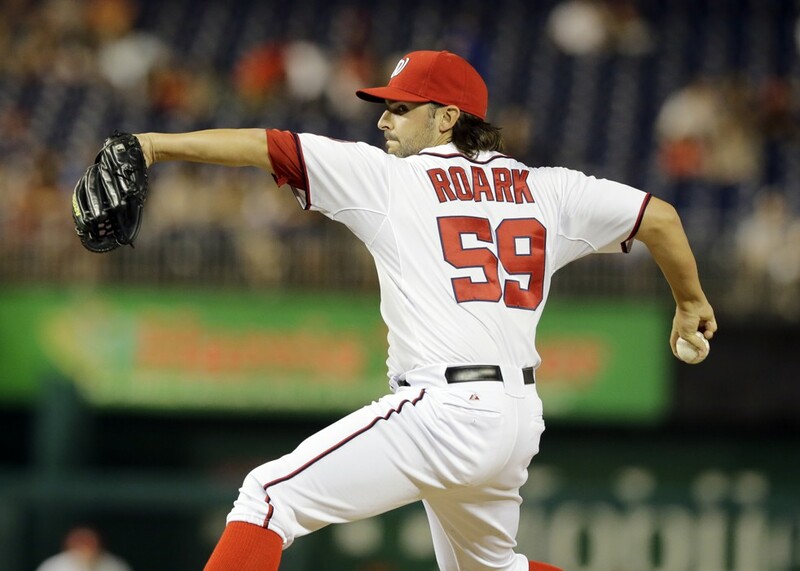 Roark’s body of work both in 2013 and over the past few seasons warranted his call-up, and his mixture of success both in the starter role and in a long-relief role in AAA made him the perfect candidate to replace Ohlendorf when he hit the D/L. 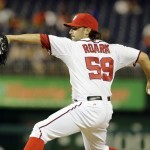 All Roark did upon arriving in the majors is pitch lights-out (a 252 ERA+) in 50 innings mixed with starts and relief apperances. Here was my “first look” post on his relief debut, and by the end of the season he was putting in a series of effective starts in the rotation. Outlook for next season: he’ll compete for the 5th starter job in spring but may not win it. Its hard to imagine a guy who threw 50+ innings of 1.50 ERA ball to NOT make the team the following spring; I see him as the 6th guy in the bullpen and the first emergency starter in case someone gets hurt. Zach Duke got one spot-start but was mostly a reliever; see the next section. Washington relievers. We’ll work the relievers backwards from the closer down the pen, starting with the original 7 guys in the pen to start the season and work from there. Rafael Soriano was a surprise FA signing late in the 2012-2013 off-season, seemingly a Scott Boras special for the Nats. His signing unsettled the bullpen, brought in a veteran with a history of malcontentness and under-performance when he wasn’t closing (just look at his stats in closer and non-closer seasons), cost a ton of money, and cost the team their 1st round draft pick (which could have netted them quite a prospect, as discussed in my draft review post here). Other than that, I thought it was a fantastic signing (sarcasm). For the year he went 43 for 49 in save opportunities, finished 58 games (important b/c his 2015 option vests if he “finishes” more than 120 games), and pitched relatively pedestrian stats for a highly paid closer: 3.11 era, 122 ERA+, 1.230 whip. Certainly he wasn’t putting up the kind of lights out numbers we saw from other such highly paid closers. Outlook for next season: back in the closer role, hopefully finishing fewer than 62 games so we can jettison him and his $11M salary. Tyler Clippard returned to his dominant ways of 2011, throwing 71 innings of 2.42 ERA/158 ERA+ ball. He showed why he’s best suited to keep in the 8th inning role even if it costs him money in arbitration. He remains the most effective reliever in the pen and is well worth the $6M he seems set to attain in arbitration. 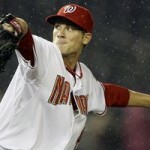 A more interesting question eventually awaits the team; is Clippard going to price himself out of our bullpen? Perhaps not this off-season but maybe next, he should be moved to a team to assume their closer role and provide value commensurate with his rising salary. Outlook for next season: back in the 8th inning role. Drew Storen seemed to be the most unsettled by the Soriano acquisition, perhaps coupled with PTSD from his meltdown in the 2012 NLCS game 5. He was ineffective in April, got it together for a while but then just blew up in July, giving up 14 runs in 9 innings and earning a demotion to work on his (admittedly) inconsistent mechanics. To his credit, when he returned he was back to normal, giving up just 3 runs in 20 innings to finish out the season. Lets hope he’s back to normal and can contribute for 2014. Thanks to his inconsistent 2013, his name isn’t being mentioned as much in trade rumors, so hopefully that gives him some peace of mind this off-season. Outlook for next season: back in the 7th/8th inning role. Craig Stammen continued his excellent workhorse performance as the classic right-handed middle reliever. He put up a 2.76 ERA in 81 innings over 55 appearances. Nothing much to say here; the biggest question with Stammen may be what happens NEXT off-season, when he faces the third and fourth arbitration years. What kind of contract would you pay for him? Is he going to price himself out of our bullpen? We’ll see. Outlook for next season: back in the 6th/7th inning middle relief role. Ryan Mattheus was putting up the expected decent middle relief numbers when he imploded in San Diego in late May, giving up 5 runs in an inning. In a fit of pique he punched a wall, broke his pitching hand (didn’t he ever see Bull Durham? Never swing with your pitching hand!) and was sent to the D/L. More importantly, I think the organization lost quite a bit of respect for him. He returned two months later but pitched relatively poorly the rest of the season, finishing with a 6.27 ERA. That’s just not going to cut it, not with the kind of arms who are pushing for spots lower down in the organization. I think Mattheus will lose the competition for middle relief coming out of spring and will be sent to AAA as reliever depth. Outlook for next season: AAA bullpen. Henry Rodriguez was his typical self for the Nats early in the season; wild, ineffective and out of options, limiting the team’s flexibility. Somewhere along the line the team finally gave up; DFA’ing Rodriguez and somehow working out a trade to get something back (Ian Dickson from the Cubs). Thus ends a long, frustrating tenure with the team. The Cubs, for what its worth, DFA’d Rodriguez just 6 weeks after acquiring him, outrighted him to AAA Iowa, where apparently he got hurt after just 3 games and finished the season on the D/L. He’s pitching in winter ball now so it must have been a minor injury. Outlook for next season: on Chicago’s AAA team presumably. Zach Duke was inexplicably ineffective for the team in the early parts of 2013, and was subsequently released in early June after the team presumably lost patience with him after an awful spot start and an even more unnerving 4 walk relief outing. It goes to show you; sometimes you cannot trust small sample sizes. Duke pitched great in September 2012, awful in April 2013 … but then was absolutely fantastic for Cincinnati down the stretch working primarily as a loogy. Go figure; maybe our loogy solution was in the pen the whole time. Outlook for next season: he’s not listed as a FA, so presumably he’s still under contract to Cincinnati right now. Fernando Abad was a MLFA signing last off-season who pitched great for Syracuse and earned a call-up in May. He toiled in the pen decently most of the year for the big-club but wasn’t considered valuable enough to keep. The team DFA’d him ahead of this year’s rule-5 draft and then worked out a trade with our favorite GM Billy Beane. This somewhat surprised me given Abad’s macro numbers for 2013 (3.35 ERA in 37 innings) but not when considering his lefty splits (a .306/.338/.452 lefty-lefty split for the year). Outlook for next season: in Oakland’s organization. Ian Krol exploded onto the scene for this team, getting a surprise call-up in June from AA that coincided with the Duke and Rodriguez DFAs. Here’s my “first look” post on him, pointing out the issue (he really has just one pitch) that would eventually drive him back to the minors. Still, for a 22-yr old who had no experience above AA, he pitched pretty well; he maintained a sub 3.00 ERA until mid August and finished the year with a 3.95 ERA in 27 innings. His lefty split numbers: .220/.273/.320. 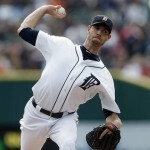 This was good enough to intrigue Detroit, and Krol was included in the package that acquired Doug Fister. Outlook for next season: in Detroit’s organization. Erik Davis was Syracuse’s closer in name for a bulk of the season, earning 15 saves while posting a 3.10 ERA in 52+ innings. He was a Sept 2012 pre-rule5 40-man addition and spent a week in the MLB pen in June before getting recalled for September. In 10 MLB appearances he gave up zero runs in 9 of them and showed excellent middle-reliever stuff (12/1 K/BB ratio in 8 2/3 innings). Outlook for next season: AAA bullpen again; he won’t beat out the names above him for the MLB bullpen. Xavier Cedeno was an April 2013 waiver claim off of Houston (of all teams), who spent most of the season in Syracuse (save for a quick June call-up). 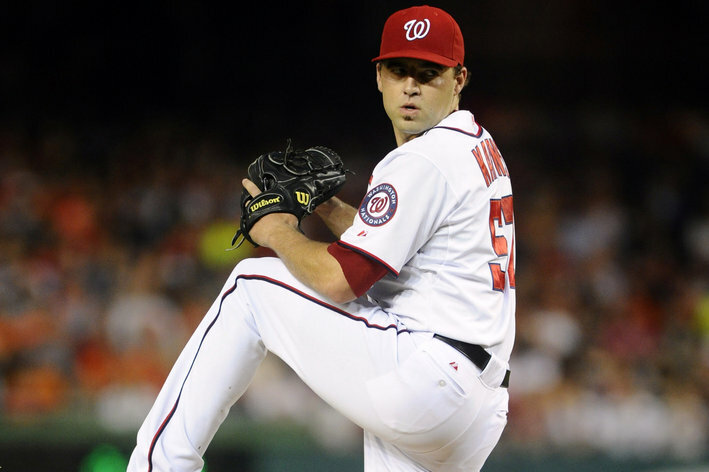 In September, he pitched pretty effectively, giving up just one run in 9 outings and 12+ innings for the Nats. He clearly hasn’t shown the team enough to be counted on as the go-to loogy, considering the Nats off-season trade for Jeremy Blevens and their talk of using the likes of Detwiler and/or Sammy Solis as lefty reliever help in 2014. Outlook for next season: Syracuse bullpen. Lastly, Yunesky Maya got a call-up to provide bullpen relief, got blitzed, DFA’d and outrighted. See the Syracuse writeup for more. Washington’s rotation was by most measures a top 5-6 rotation in the majors (7th in starter ERA, 6th in starter FIP and 3rd in starter xFIP/SIERA). Clearly we look to be improved on the rotation side, with Haren’s starts being replaced by the underrated Doug Fister, with a healthy Detwiler and with plenty of reinforcements to back the starters up. Look for this to continue to be a source of strength in 2014. The bullpen however was not a source of strength last year, ranking between 17th and 19th in the macro pitching categories (17th bullpen ERA, 19th bullpen xFIP and 18th in bullpen SIERA). Has the team done enough to improve the bullpen for 2014 by just replacing the under-performers with call-ups and signings?